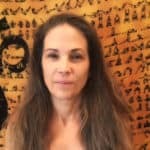 Eileen became a certified yoga teacher in 2000 through Frog Lotus Yoga Studio in North Adams, MA. She began teaching Vinyasa-style yoga in Blacksburg in 2001. In 2007, with her husband Rob Patzig, she completed a second 200 Hour Yoga Teacher Training with Dharma Mittra in New York City. Over the years she has had the privilege of encountering many amazing teachers and styles. Eileen blends different influences, especially from the Dharma Mittra, Jivamukti, and Laughing Lotus schools. Her classes are demanding but suitable for all levels. She believes that the practice of yoga asana is the most important thing in life: not because it is literally the most important thing in life, but because it supports our life’s calling and whatever else we love to do.